Coconut flour can replace 20-25% of the flour requirement for non-gluten free recipes. 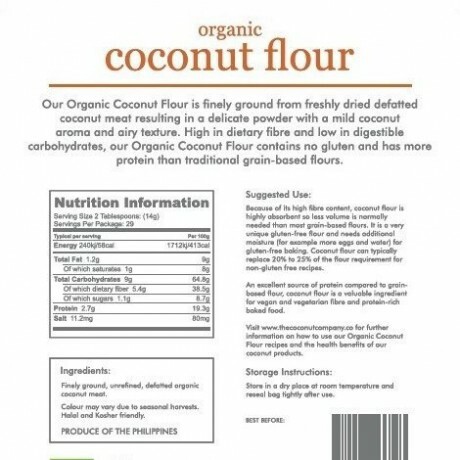 Organic Coconut Flour - 100% raw, high in fibre & gluten-freeDirections: Use as you would other flours for baking, but as coconut flour is highly absorbent use more moisture in your recipe (e.g. more water, milk or eggs). Store in a cool, dry place at room temperature.Reseal pouch tightly after use. Contains around 65% coconut oilA convienient way to use coconut milk - long life! Retains much of the nutritional content of the raw coconut! 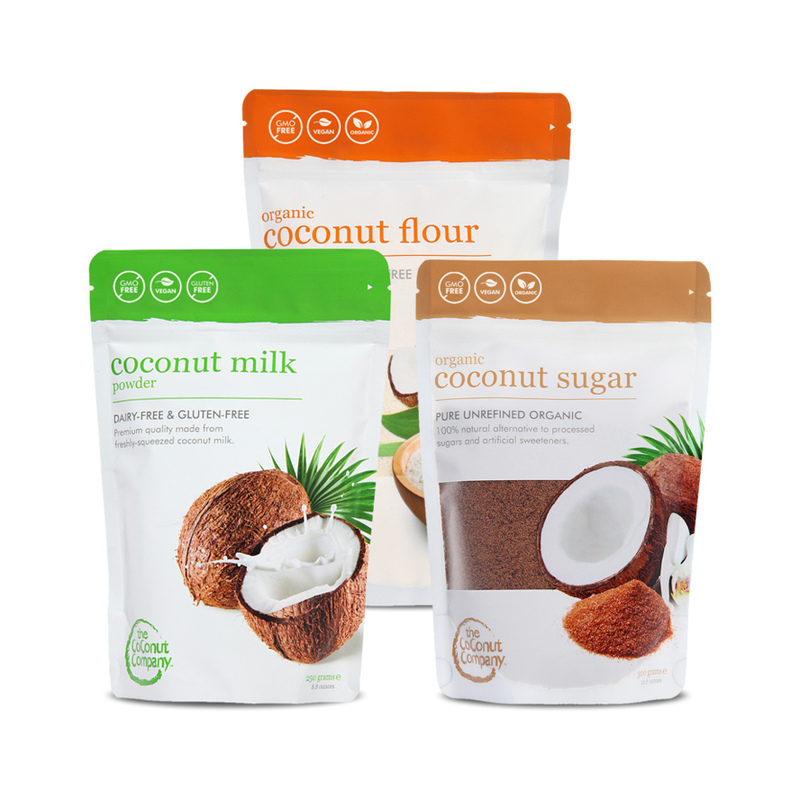 The Coconut Company's Premium Coconut Milk Powder is a versatile and convienient addition to your kitchen. It has a much longer life than canned coconut milk once opened and is produced from freshly squeezed coconut meat, that is then dried. Use on breakfast cereals, in coffee, smoothies, milkshakes, yoghurts and ice creams. An excellent flavouring for curries, vegetable dishes, desserts and exotic sauces. Also a good thickening agent for cakes and biscuits. It has an excellent natural aroma and contains approximately 65% coconut oil. Directions: Mix 1-2 tablespoons in a cup of warm water and stir well to produce rich instant coconut milk or cream. Alternatively, add directly to curries or sauces. 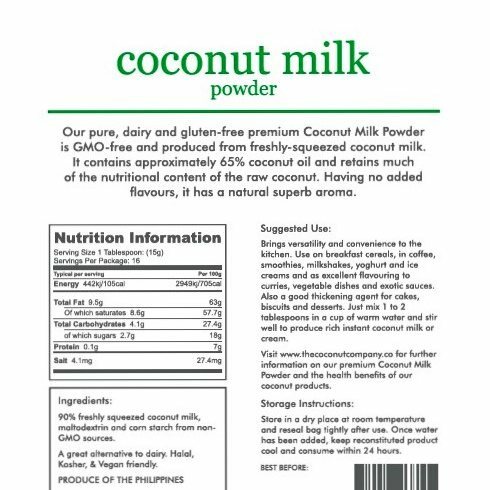 Please note that our coconut milk powder has a high oil content and therefore can take time to dissolve. The high oil content provides the high lauric acid component (medium-chain triglyceride), which have many health benefits. It also ensures it's super tasty! Contains vitamins and minerals extracted from the raw sapCoconut sugar can be used as a direct substitute for other sugars. Coconut sugar has a distinctive delicious aroma with no aftertaste. 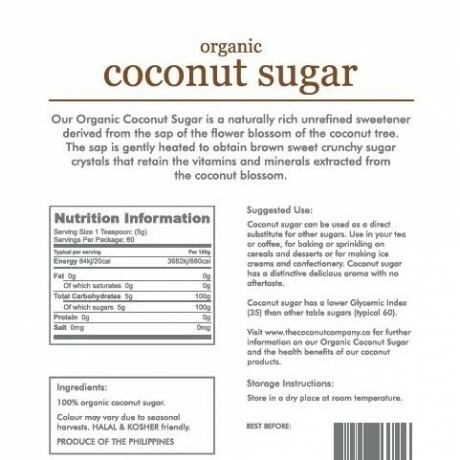 Directions: Coconut sugar can be used as a direct comparison to other sugars. Use in hot drinks, for baking, sprinkling on cereals, desserts or for making ice creams or confectionary. Coconut sugar has a lower glycemic index than many others sugars (around 35).